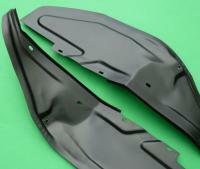 Reproduction metal mudshields. A direct copy of the original Ford inner wing shields fitted to the late Mk IIIs. Will fit all models 1974 onwards. Protect those vulnerable wings with these Ford designed mudshields which stop mud build up in the wing corners behind the front wheels.